Compatibility: Fluotics designed its Tecan P50 MCA tips for maximum compatibility with the Freedom EVO and Fluent robotic liquid handlers. When using our Freedom EVO and Fluent MCA compatible automation tips a separate labware definition is unnecessary. Tecan automation control software protocols also do not need to be modified. 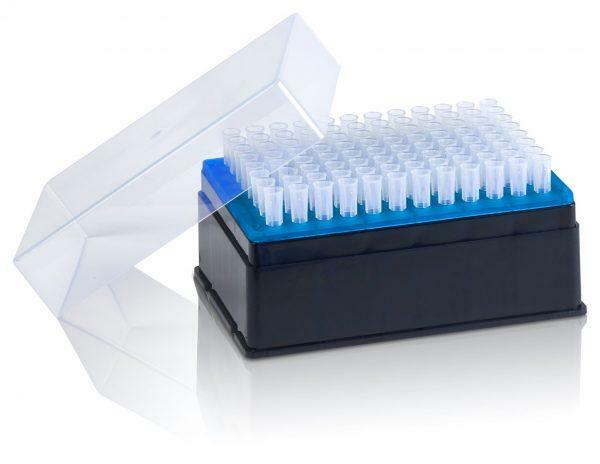 This Tecan 96 format tip is designed to be interchangeable with the original Tecan P50 automation pipette tip. Applications: A 96 format tip for volume transfers up to 50 µL with a filter, this Tecan automation P50 tip type offers versatility in designing protocols. These Tecan tips can be used to access both 96 format and 384 format plates and fits all 96 MCA heads on Freedom EVO and Fluent liquid handlers. Manufacture: Fluotics produces its Tecan Freedom EVO and Fluent compatible P50 tips from the highest grade virgin polypropylene. We use ultra polishing techniques to ensure low liquid retention without the use of releasing agents or other additives.